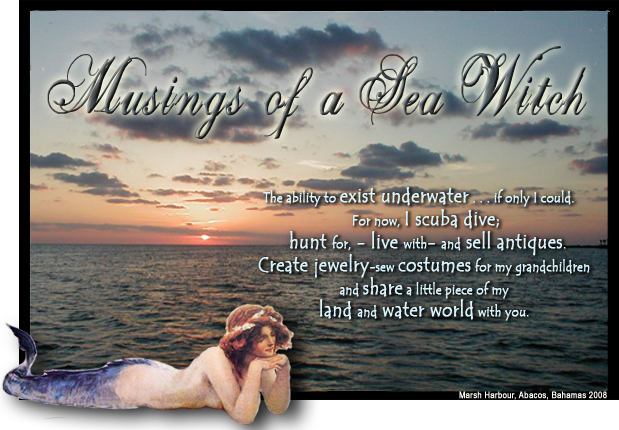 Why is it that when you are on the hunt for something, you rarely can find it--and yet, when you are not looking for anything in particular, the most interesting items appear? I am on the hunt for a cupboard hutch to display my antique American baskets and store items in the cupboard. I have come across these often and never had the need for one. Now that I'm looking for one, they all seem to have fallen off the face of the earth. Still it was a marvelous Saturday for the hunt and although I did not find a hutch, I did come into other treasures. First stop, Hodge Podge in Monroe,GA. 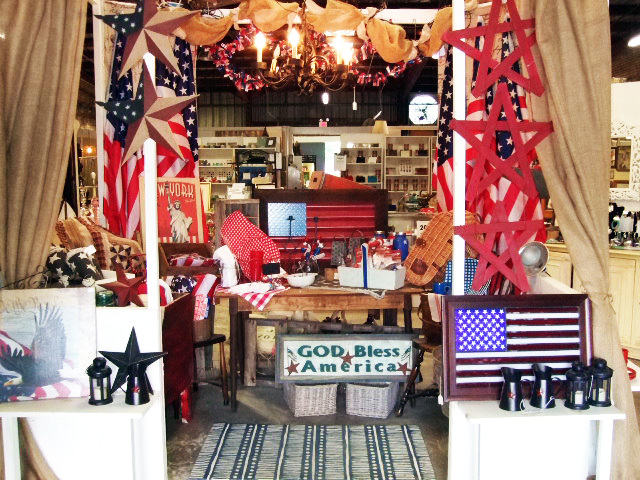 As you enter the shop you are greeted by this marvelous Americana scene. Some great open highway items are favorites with men so consider these for Father Day. I am head over tea kettle with this fantastic repurposing of vintage photo slides. What a great idea. No hutch's to be found so it was off to Davis Street Antiques. 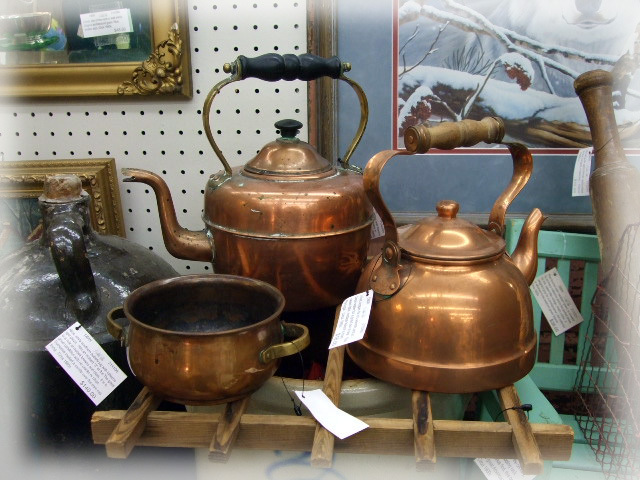 Of all of the antique shops in Monroe, Davis Street is always my favorite. 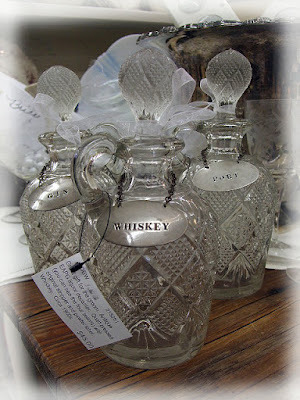 Although no hutch found at Davis, I did find three nifty items. 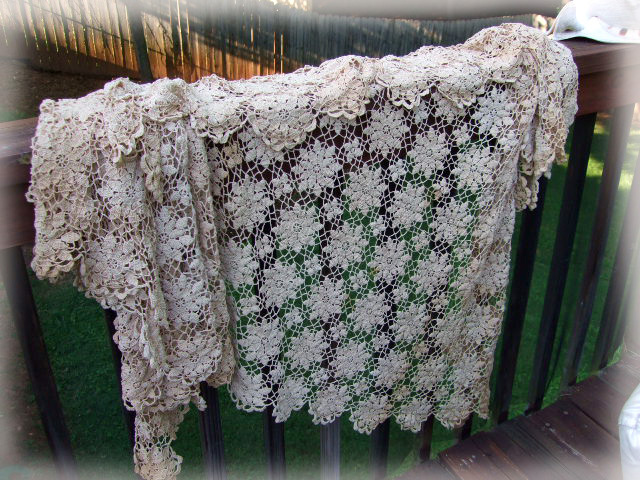 This gorgeous hand crocheted antique tablecloth was a lovely find. Doing the happy dance with this marvelous EAPG compote. The compote was made by Challinor & Taylor between 1885-1893 and is known as open lattice with a basketweave base. Be still my Vaseline loving heart. What a find. 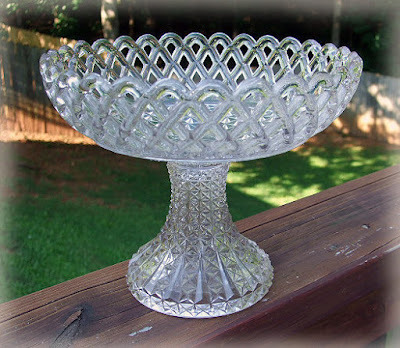 Rare, Vaseline, Early American Pattern Glass (EAPG) bread plate. Raised textured lettering and then the profile of General Ulysses S. Grant done in intaglio. This bread plate (shaped like a bowl) is a Victorian commemorative bread plate with a raised edge. 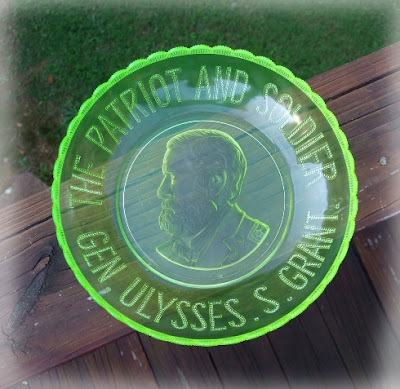 The plate reads: GEN. ULYSSES S. GRANT THE PATRIOT AND SOLDIER. 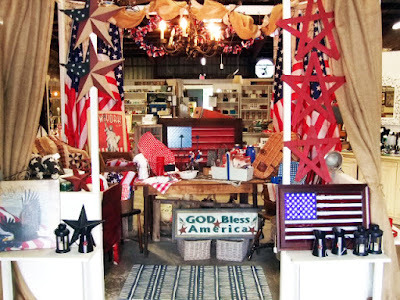 From Monroe, I headed out to Vintage Village in Snellville hoping to find that elusive hutch. So many talented dealers at Vintage Village and one of my favorites is My Vintage Heart. She always has the prettiest little decorative vignettes. 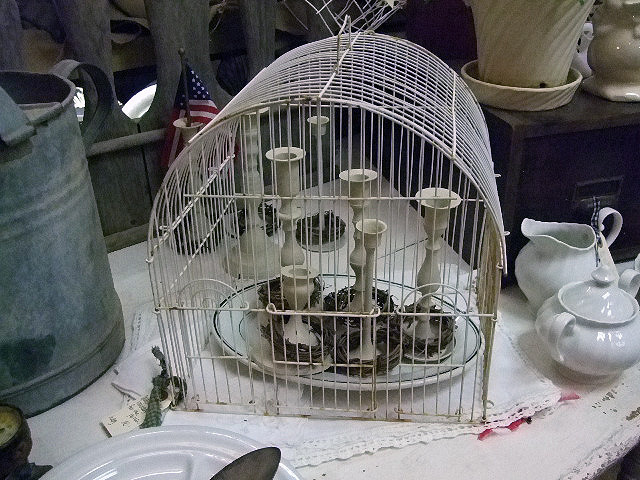 Such a sweet way to display candlesticks using a birdcage. See, another delightful vignette. 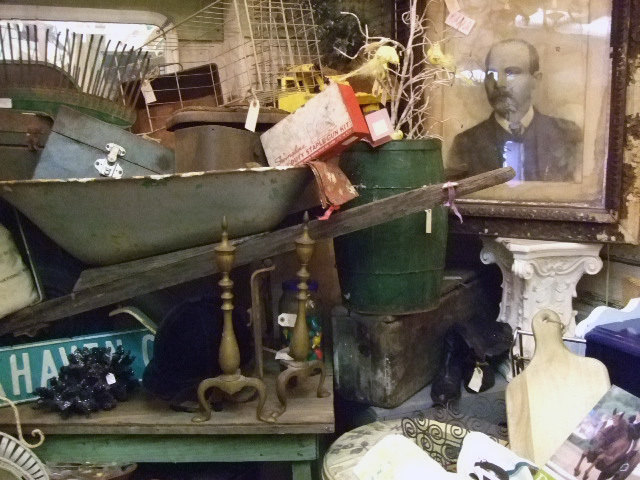 Treasure everywhere at Vintage Village. 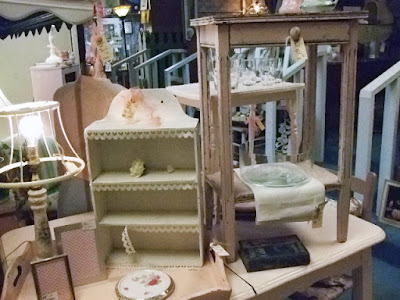 Another favorite dealer, Pink Glory, finds chippy pieces in the softest and palest shades of pink. 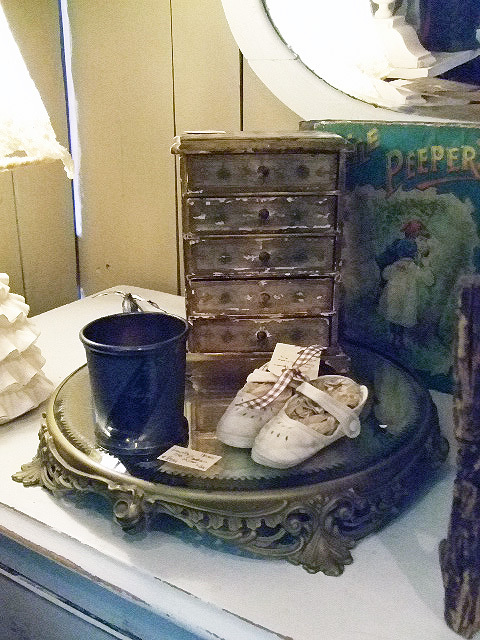 I had to be strong and not walk away with this darling little table. 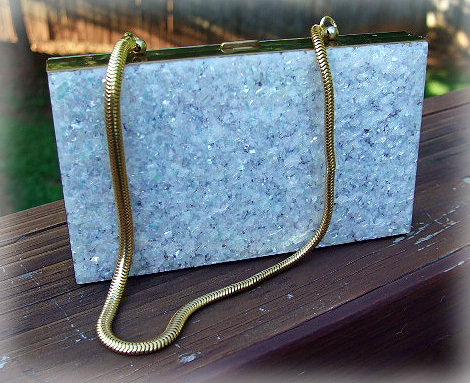 But I couldn't walk away from this stunning little "necessary" purse. 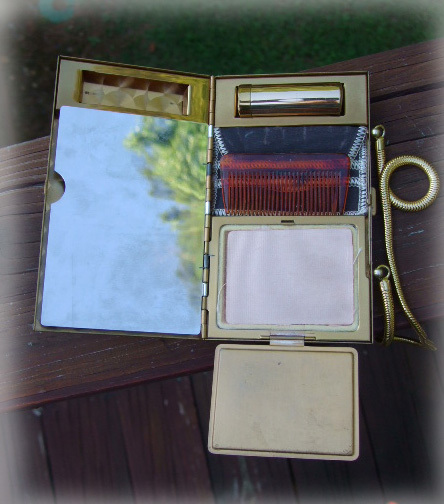 Popular in the 1950s, this purse had everything a girl needs, a place for lipstick, compact makeup, cigarettes, comb, mirror and mad money. This beauty is in pristine, never used condition. How cool is this? 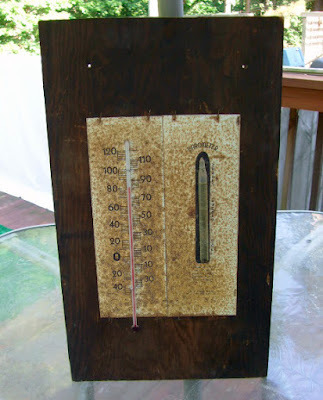 A vintage thermometer and barometer stapled to an old piece of plywood. Still no hutch, but I did find some nifty pieces at a local thrift store. 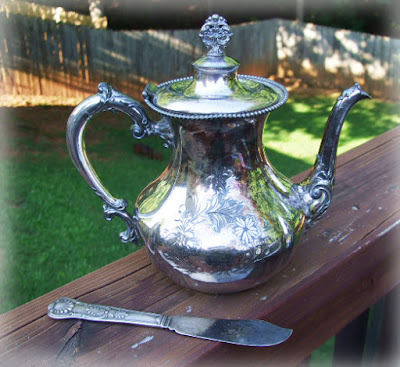 Beautiful quad plated teapot in very good condition with lots of original silver and a Victorian Gorham butter knife. 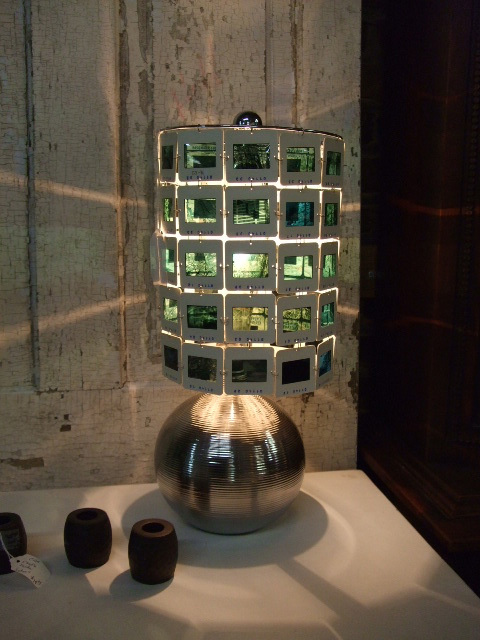 Fantastic Arts and Crafts light shade. 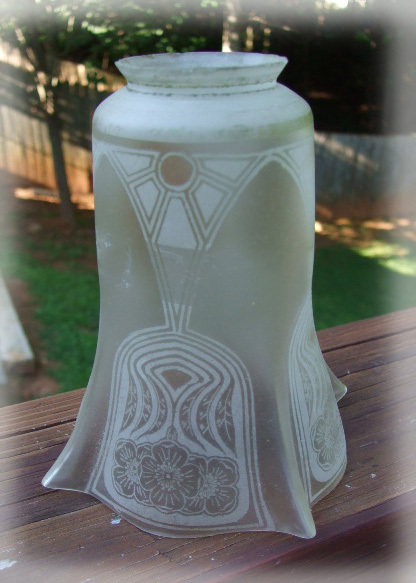 Beautiful etching on it and unique shape. Unique antique napkin ring has three men's faces on it. Any help identifying it is welcomed. 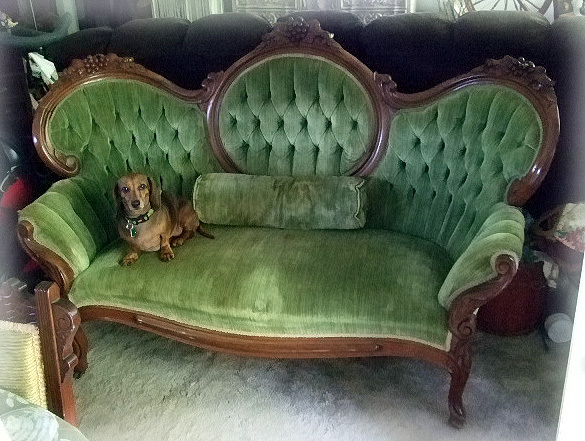 This was an auction win from two weeks ago. 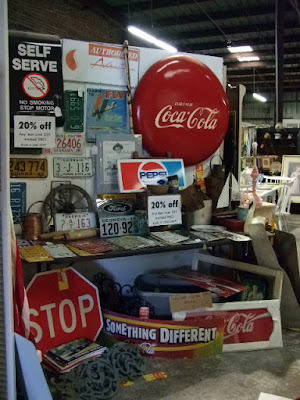 Nobody was bidding on it and when it dropped to $50.00 my paddle went up and it went home with me. In gorgeous condition, this beautifully carved frame sofa with original upholstery is a keeper. My sweet girl, Gynness, likes it to. Marvelous EAPG liquor decanters with pewter labels make a terrific groom or groomsmen gift. 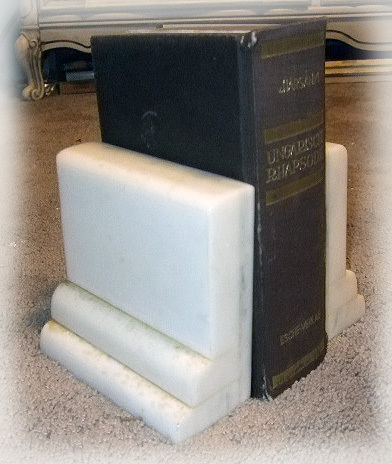 Another auction win. 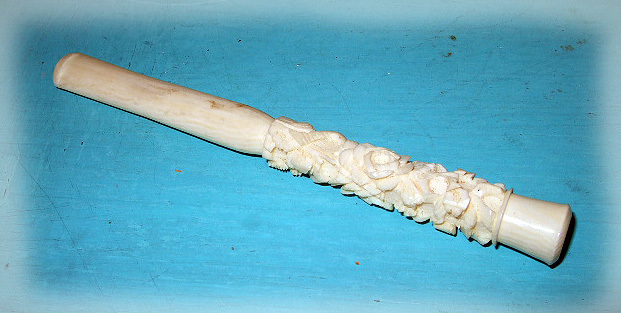 Nothing like a carved bone cigarette holder to make a statement. Very art deco and never used this is a fun piece to own. Won a box lot of vintage copper. 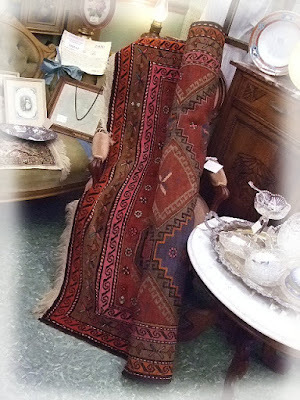 Magnificent Persian rug, Kurdish hand knotted and natural vegetable dyes, this rug is in excellent condition and in my Victorian space at the Buford Queen of Hearts.